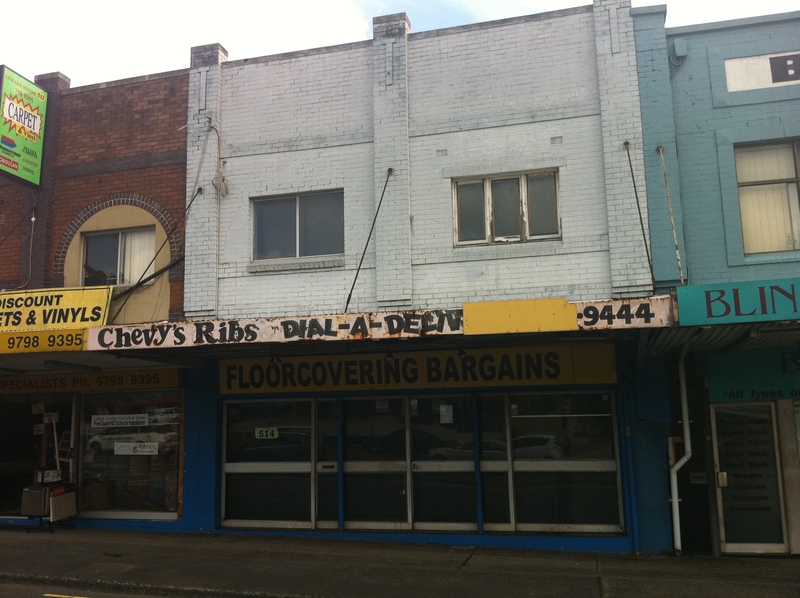 Chevy’s Ribs on Parramatta Road seems like the kind of place you might have filled up on greasy food at before heading off to drag up Underwood Road and through the abattoir at Homebush. Luckily, if you were too lazy, Chevy appears to have offered a delivery service. That was nice of him. Also, does it mean bargains within the realm of floorcoverings, or bargains so mindblowing you’ll cover the floor with something? UNCOVERED UPDATE: Hope you weren’t looking for floorcovering bargains, because you won’t find ’em here no more. Thanks to the collapse of the floorcovering market (or a fortuitous gust of wind), the true extent of Chevy’s Ribs has been exposed for all to see. That 70s font, that boastful tagline! I can’t help but wonder what that difference was, just as I can’t help but wonder if Chevy’s delivery service pre-dated Silvio’s Dial-a-Pizza (1978)? Only Chevy knows…and he’s not talking. I remember this shop, it opened for a short time in the mid 80’s.